The liver is the second largest organ in your body. It processes the food and drinks you consume into essential nutrients, and also filters out harmful or toxic substances from your blood. Tropical fruits such as bananas, pineapples, guava, mangos and lemons grow in warmer climates. While these fruits do not cause liver damage, you may need to avoid certain minerals that occur in these fruits if you already have a liver disease. Many different problems or diseases can cause liver damage. Some conditions are genetic and others result from chemicals and toxic substances. Different conditions can cause liver damage, including hepatitis, cirrhosis, cancer and parasite infection. Symptoms of liver damage include yellowish skin, abdominal pain, itchy skin, dark urine, chronic fatigue, nausea, tar-colored stool and loss of appetite. Several factors can increase your chances of developing liver damage, including heavy alcohol use, diabetes and certain medications. Pineapple is a tropical fruit that contains a trace mineral known as manganese. Your body needs manganese for various physiological processes. However, too much manganese can cause toxicity. A 1/2-cup serving size of raw pineapple chunks contain 0.77 milligrams of manganese. Adults should not consume over 11 milligrams of manganese per day, according to the Linus Pauling Institute. People with chronic liver disease are at a higher risk of manganese toxicity because their bodies cannot eliminate excess manganese through bile. 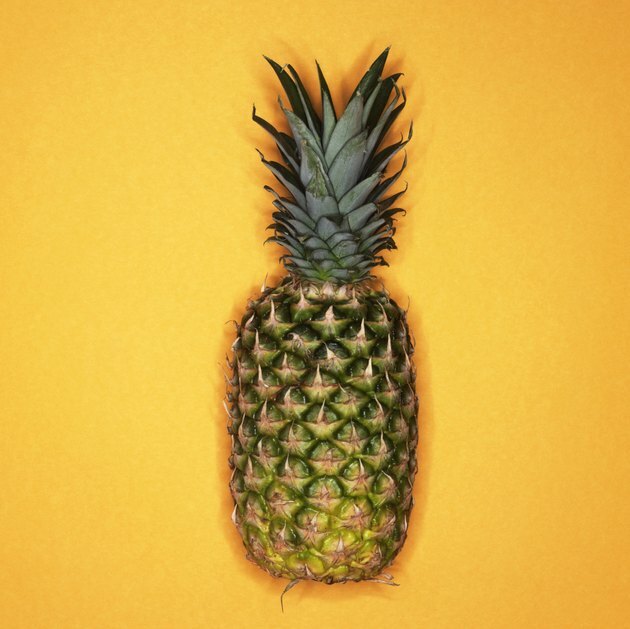 People with liver disease who eat a lot of pineapple or other foods high in manganese could develop neurological symptoms, such as Parkinson's disease. Hydroxycut, a supplement that promises weight loss, may cause liver damage, according to the Food and Drug Administration. Hydroxycut is made from tropical fruits, but the exact ingredient that causes liver problems is unknown. In 2009, Hydroxycut voluntarily recalled 14 of its products after the FDA received 23 reports of liver damage. One 19-year old boy died from liver damage. Other patients had symptoms ranging from jaundice to complete liver failure. These patients were healthy before they began using Hydroxycut products. People with liver disease usually need to change their diets. Talk to your doctor or nutritionist about specific diet recommendations. Severely damaged livers are unable to process proteins, so you may need to limit your protein intake. Medline Plus recommends you consume 1 gram of protein per kilogram of body weight. You may need to increase your carbohydrates, which will help to prevent protein breakdown. In addition, sodium may increase swelling in the liver, so reduce your sodium intake to less than 1,500 milligrams per day.